The Greater Phoenix Chamber of Commerce’s (GPCC) Valley Young Professionals’ Board of Directors welcomed six new members to the Board. Each new member was selected based on their past involvement in VYP and the vision that they bring to the Board. Lindsey Thompson is an Associate Brand Manager at Shamrock Foods Dairy. 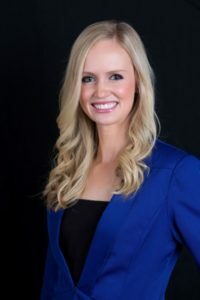 As a VYP Board Member, Lindsey engages with and welcomes young professionals who are new to the Greater Phoenix region and provides a hub for those who want to explore Phoenix has to offer. Proud to call Phoenix home, Lindsey is passionate about topics that make Phoenix a better place to live such as supporting small businesses, educational programs and environmental initiatives. Question: What are you hoping to gain from your experience as a new VYP Board member? Answer: As a new VYP Board member, I look forward to making a positive impact in our community, building lasting relationships with other professionals, and continuing to build engaging programs for young professionals in the Valley. Question: What opportunities do you see in the future for young professionals in the Valley? Answer: There’s immense opportunity for young professionals in Phoenix; we live in a city that is now the 5th largest in the nation! With the rapid growth of companies moving to Phoenix and with its entrepreneurial spirit, I see expanding opportunities in the Valley that includes mentorship programs and networking in a variety of sectors for young professionals. Question: What experiences and perspectives do you bring to the board that you hope will be valuable to the Valley Young Professionals group? Answer: I’ve lived in a variety of cities and am proud to call Phoenix home. I plan to bring a fresh perspective to the board that includes brand building and marketing with a focus on digital media. I want to help create a network amongst our young professionals in the Valley, so they feel connected and supported to grow their career in our community.